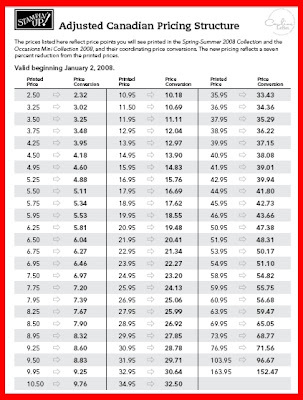 New Canadian Price Chart for 2008! As I mentioned in yesterday's post, Stampin' Up! has decided to further adjust the lowered 2008 catalogue item prices by an additional 7% (in Canada only). Because the catalogue had already gone to print when they made this decision, they have now created a handy-dandy price conversion chart for us to use. Here is a full page version that you can print out to keep with your new catalogue. For my own personal use, I trimmed all 4 sides by about 3/4" and then just pasted it to the back cover of my book for handy reference. I've also added the link permamently to the blog on the left-side, so you can access it any time you like. Long live the strength of the Canadian dollar -- LOL! Happy Holidays to all... now, come & get 'em! Thanks to my hubby taking some unexpected additional time off, I've enjoyed a few extra days of holiday downtime with the family. Yippee! 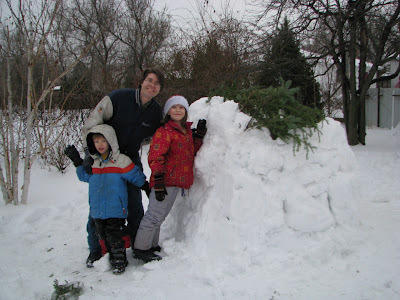 We all deserve a special break now and then, and ours has been filled with snowfights & forts, great food, family & friends. I'm hoping your holidays have been wonderful too! 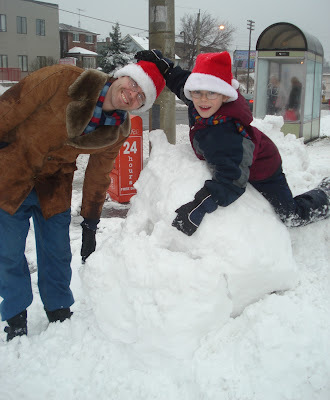 With the kids home from school and only returning back on January 7th, I'll be keeping only a very light work schedule between now and then, but will continue to update the blog with fun projects for you. THE NEW STAMPIN' UP! CATALOGUES ARE HERE! Yes Virginia, there is a Santa Claus -- and he's brought me many gorgeous cases of the new "Spring-Summer 2008 Collection" to share with all my stamping friends! If you pre-ordered your catalogue through me, you are welcome to stop by my studio Friday evening (6-9pm) or Saturday (9am-3pm); mail-outs of catalogues will begin today as well. If you forgot to pre-order, that's okay too, as I ordered some extras. Just drop me a line and we'll make arrangements to get you yours. I'm holding my final stamping class for 2008 tomorrow, Saturday Dec 29 at 1pm -- a Kid's Stamp camp for you and your favourite junior stamper (6+ please). Class details can be found on my Events page, please RSVP if you would like to attend (Toronto and GTA). Well, it's December 24th and we're home safe and sound in Toronto from a wonderful few days in Belleville, with many great memories of snowforts & snowball fights, feeding llamas, "Enchanted" and quality time with Papa LeBel, Mary and their cats Octavia & the super hippopotamus-feline hybrid Sylvie. I'm sure I'll have some great pictures to share in the days to come. We arrived this afternoon with just enough time to unload the car, put the house back in order, have some dinner and then make our traditional cookies for Santa. We've now put up the stockings, and watched "How the Grinch Stole Christmas" and "Cosmic Christmas" with the kidlets. The carrots are out for the reindeer, and Morgan is too pooped to stay up so he asked to go to bed early, "so that Santa will come here quicker!" ETA: It's now 8:35 and it's back out of bed, and tracking Santa via NORAD with his big sister. I want to wish you ALL the most wonderful Christmas season of joy and peace. May this time be spent with those near and dear to you all, with love and happiness. These last 3 cards were received from Robin, Carol and Juanita. MERRY CHRISTMAS and I'll be back briefly on Boxing Day to check in with you all! So long....farewell... auf Wiedersehen, goodbye! 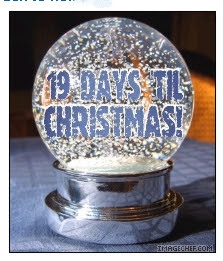 I'm off to Belleville for a few days of family holidays, so I leave you with this quickie Holiday Countdown post, courtesy once again of Geri & Mary. This is how amazingly easy it can be to dress up a simple (and delicious!) gift of homemade Xmas goodies. A bit of stamping, a few ribbons, a tag and voila! A treat that you almost don't want to open up 'cuz it looks too cute. Theese two sure make me wish that I could bake more than just refrigerated Pillsbury dough cookies. 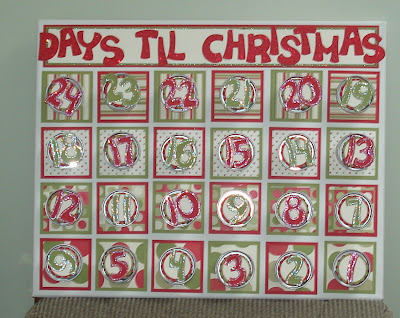 Day 21 of Holiday Countdown: A Christmas Countdown Clipboard! Okay, you SO have to click on the clipboard to see it enlarged, because this shot simply does not do justice to it. I received this today from my friends Mary & Gerri, and it's just the coolest magnetic Christmas Countdown clipboard EVER! I love all the beautiful detailing and craftswomanship that went into it -- it's so positively fab. And I'm dying to know how you magnetised it, Gerri... I also got all the little tags with numbers that I need, each with a small magnet on the back so that it stays on the board. C'mon, honestly, it's this the BEST??!!! I also got a cute stamped bag of cookies that they baked together, but I'll share that with you tomorrow. Not the cookies, silly... those are all mine. Yeah, yeah, I guess I can share with the kidlets and Brent... but that's it. I'm leaving bright and early for glorious (ahem) Belleville for the weekend to celebrate the holidays with family, but stay tuned on the blog for some more holiday countdown fun while I share more stamping creations from my peeps. I don't know about you, but at this time of the year I'm constantly remembering that I need gifts for those everyday peeps in my life: the coffee gals at Country Style, Loula our crossing guard, my Man in Brown and the postman too. Rather than just slap a bow on a box of chocolate, I want to do something a LITTLE bit "more", but frankly Miz Scarlett, I just don't have the time for it. So here's a nifty compromise that still lets me feel crafty for a minute or two. A 2" strip of designer paper, some scrumptions Pomegranate satin ribbon and a label from the "Hand Selected Accents & Elements" tin (part of the "Wrapping Up the Holidays" promo). Truly, it doesn't get much easier than that! No, the card is not sad. It's not lonely, either. But it has been distressed around the edges with White Craft ink, for that lovely snowy effect. Isn't it pretty? I got this in the mail today from my dear friend Sheilagh (who I miss dreadfully -- come play with me soon, girlie!) so I'm sharing her beautiful card with all of you. 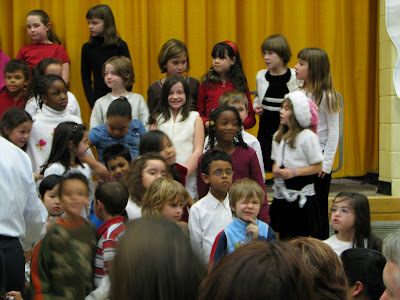 I've just returned from my son's Holiday school concert, and what a blast that was. There's Mister Morgan in the bottom-right corner, the one in the blue. The one squinting and making a face when he saw me with the camera. He cracks me up totally!! At the intermission, this little six year old stud-muffin asked me for money to buy a treat from the bake sale for his best "girl friend", as he wanted to surprise her with something. Sigh. Merry (early) Christmas to me! Yesterday I had to go to the dentist for a procedure that required sedation. Yes, I'm a big chicken and there are just some things I need good drugs for, and letting people stick sharp implements in my mouth is one of them. I was tempted to share the picture Brent took of me asleep in bed with my catalogue clutched tightly to my chest, but frankly, it's not the most attractive photo ever taken. Instead, here's a picture of me AWAKE this morning with my precious. To all my gals who have pre-ordered copies (that includes you Stampers Club members too), Canada Post is supposed to deliver my 20 cases of books on FRIDAY DECEMBER 21. I will keep everyone posted and I *will* make myself available that afternoon/evening for pickups before I leave Toronto for Belleville Saturday morning. Anyone who has opted for mailed delivery WILL have it mailed that day too. Stay tuned for more details.... and happy stamping! The first is from Cherie and the 2nd from Joyce... have a great day everyone! That's kind of a joke... since Toronto is being bombarded with snow as I write this. But I *did* want to share a few green holiday cards with you anyhow, made by my friend and fellow demonstrator Sheree Timmermans. Aren't they lovely? The horse cards were custom designed for someone, and the last green card was the one she gave me for Christmas. Love them! I especially love the sparkle of "snow" on the ground by the horses, y'all know what a fiend I am for glitter. I'm currently high off all the brownies and holiday nibblies I've been eating since the first of my classes began at 9am this morning... let's hope I come down from all the sugar and caffeine eventually! And it IS a good morning; with Morgan back at school, my new Stampin' Up! "Spring-Summer 08" collection pre-order goodies at hand, a nice French Vanilla coffee at my craftin' table and the next few hours ahead of me to finish preparing for tomorrow's Quarterly Stamp Camp.... yes indeed, a good morning. Here is a little sneak peek for you of 3 of the 8 cards we'll be making (since I already showed you the scarf earlier this week). I'm going to be naughty and NOT write up the recipes for these until later, as I'd rather jump back to keep on stamping. You all understand that, non? I do promise to come back and add them later on this afternoon, since I also have to share some of the tags that were made last night. According to the Weather Network, it's going to feel like -19 with the windchill tomorrow here in Toronto, so to all my gals coming over to play: BUNDLE UP! No holiday tags to show you today after all, since with Morgan still at home with "the-cough-&-cold-that-would-not-end" (although he's on antibiotics now for the ear infection, so my fingers are crossed he'll be back to his crazy 6-ear old self soon) there's been no stamping time for Momma. Ooh, how was that for a run-on sentence?! Anyhow, instead I'm happy to show you two beautiful cards that arrived in the mail instead, bringing me some much needed holiday cheer! The first is a beautiful window card by Laurie Pallozi, using some gorgeous watercolouring and clever uses of punches and brads. The "snowy" background is seen through clear acetate to further the illusion that you're looking through a window. The second is a lovely copper "Peaceful Wishes" card from Sandy McCulloch. She's using one of my favourite sets here, and I actually used it for about a quarter of the cards I'm sending out this year too. P.S. There WILL be tags tomorrow for you anyhow, since tonight is my "Stamp-Til-You-Cramp" tag making night. If you're interested in coming, please let me know and don't forget your adhesive and scissors. Ciao til then! Stamping on silk scarves is remarkably easy, and is an elegant way to customize a gift for someone special. Here's a sneak peek at a new set coming up in the "Spring-Summer 2008 Collection", and we'll be making this scarf on Saturday (please click on image to enlarge). FYI.. the colours used are Rose Red, Taken with Teal and Rose Romance, all Rich Regal Craft inks. Tomorrow's post will show some holiday tags plus a few more "sneak peeks" at the projects we'll be making this weekend, since my big pre-order of new sets, accessories and papers arrives today. YIPPPEEEE!!! One thing I love giving at Christmas are custom-made coupons, things like "Girl's Night out" for Serena, or "Free Video Game Rental with Mommy" for Morgan, and of course "Date Night" ones always go over well with Brent :) They're easy to create using Word, and you can make them be for whatever you want. Here's an example of how they can be dressed up... I used the retiring "Cerise" Designer paper with Real Red cardstock, and created a belly-band and tag to go over the whole kit-n-caboodle. These are going out to all my "Spring-Summer 2008 Collection" pre-order gals. If you live in Canada and want to get YOUR personal copy as soon as they're released, contact me and you'll be the envy of all the stampers on your block! 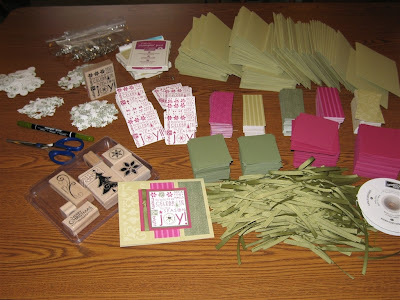 By the way, this Saturday is my big quarterly Stamp Camp, where we'll be making projects using all new sets & accessories from the upcoming book. I still have space remaining for several of the time slots, so if you would like more info on attending, please click HERE. Idea CASE'd from the oh so talented April Roycroft. 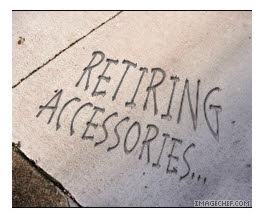 Here we have it, the official Retiring Accessories list from Stampin' Up! I'll be placing orders daily, since all items are "WHILE SUPPLIES LAST" so I'll be doing my best to help you get what you need while it's still in stock. I'm offering 15% off all your retiring accessories plus I've extended my "Buy 3, get 1 Free" offer on the retiring sets until December 15th. Don't forget, you MUST quote "website special" to get either of these exclusive deals, otherwise I'll assume you aren't interested in saving money (hehehe). Stampin' Up! 's "Wrapping Up the Holidays" is also ending on the 15th as well. In the next few entries this week, I'll show you projects I've made from some of those promotion items, like the empty silver tins, and the awesome assortment of tags I created using the Hand Selected "Accents & Elements". If you're looking for a night out to do some stamping, why not attend this Thursday's Holiday Tags camp, where you can stamp-til-you-cramp and make as many tags as you possibly can in 2 hours? Please RSVP a spot if you want to attend. With the deadline for mailing your holiday cards looming closer, why not look at how you can take a few time-saving shorcuts to pull them together faster? When I need to whip a card together and I'm short on time, the number one item I'll grab from my stamping supplies will ALWAYS be my patterned paper. Luckily for me, Stampin' Up! 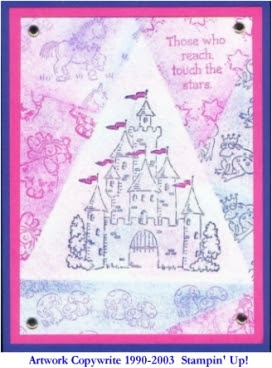 has some beautiful ones that coordinate with our colour selections & stamp sets, so it makes cardmaking likety-quick! 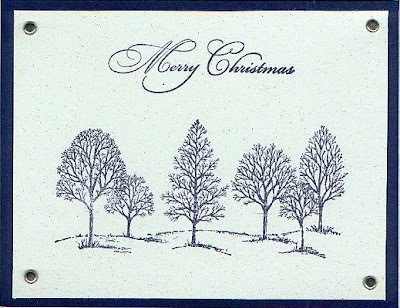 The first 3 cards are from this past Holiday card camp that make use of our Designer papers. The 4th card is a better close up of Lisa's card (shown in production mode yesterday) so while it wasn't what I'd call a quick card, its still darn gorgeous and since it uses our papers, I'm adding it for your pleasure! P.S. Don't forget to visit the blog on Monday when the retiring wheels & accessories will be posted, plus I'll be extending my "Buy 3, Get 1 free" offer on retiring stamp sets until the 15th. Although I can no longer guarantee a holiday delivery, I *can* offer a good deal! Today's post is thanks to a photo sent to me by my friend Lisa Oppitz, sharing her most recent "mass production" of holiday cards. Yes my friends, when you are creating a bazillion cards all at once, this is the ONLY way to go! Click on the photo to enlarge..
"30 ‘production’ steps to each card and yes, all of those little flowers, trees, flakes and ‘&’ were cut out by hand, yep, 1200 teeny, tiny, beautiful little pieces!" She then joked that she has an eye doctor's appointment next week... at least I HOPE you're kidding, Lisa!!!! Do YOU have a stamping story or card to share? Email me and I'll be happy to post it up for the world to see! Since I'm still stuck at home with a sick child plus a sick me, here's another card pulled from the archives for you to enjoy. Here's a card that I made back in 2005, but got a lot of positive feedback about. It's a pity the scan of the original card is so poor, as the main embellishment wasn't nearly so dark. 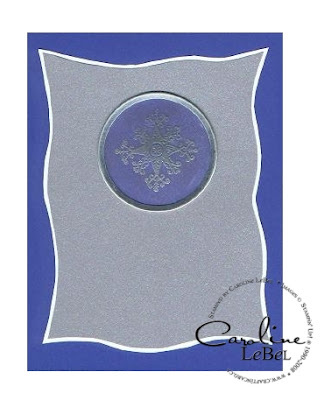 We heat-embossed the snowflake in silver on one of the vellum circle tags, and then used the brush end of the Brilliant Blue marker to colour in the reverse. The layers were just cut freehand in Brushed Silver and Whisper White, so it's a super easy card to pull together. BTW...I hope the girls at Stamper's Club last night were easy on my hubby Brent, who was my designated pinch-hitter and stepped into my stamping shoes (ha) when my stomach bug kept me at home. I'm not much better right now so I'm letting you Friday night gals know ahead of time he might be there, so that you don't rib him too much! P.S. 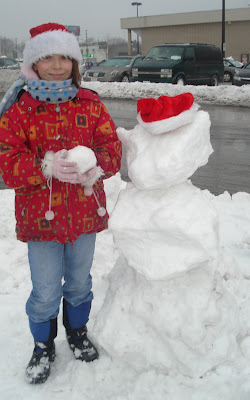 This picture is proof positive that kids will play with snow no matter where they are... even building snowmen in the grocery store parking lot! 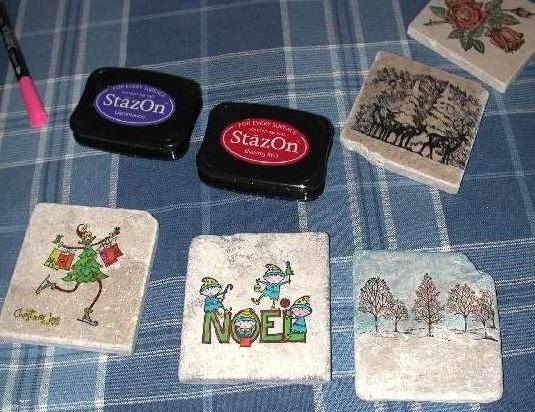 Today's Holiday Countdown project is stamping on tiles to make coasters. These tiles can be found at places like Home Depot or your local tiling store, for less than a dollar each. I prefer the tumbled marble tiles for their fun texture and ease of use, but you go with what YOU like. These were stamped with Stazon ink and coloured in with Sharpies... it was a fun project for kids to work on so I love to feature them whenever I do a workshop with Brownies or Guides. That's when I get to pull out my favourite retired Stampin' Up! kid-holiday stamps, and let them go to town and stamp their little hearts out! There are a variety of ways to stamp your tiles, so I'd recommend checking out one of the online tutorials, such as the one at Splitcoaststampers. When I'm done with the stamped top of the tile, I usually flip it over and adhere small cork or felt "feet" with a dab of Crystal Effects. This makes a nice coaster or trivet, and you can wrap a set up as a nice gift, and make a matched tag (or card, or box, or wrapping paper, or bow...hahaha... the list goes on!). I hope this inspired you to have fun playing with tiles, I know I do! p.s. If you're wondering what I'm doing up at 3am today, that's okay...so am I. Poor Morgan is running a fever and so I've getting him meds & water, but at least he's sleeping now. Me? not so much :( Let's hope my munchkin's better today. 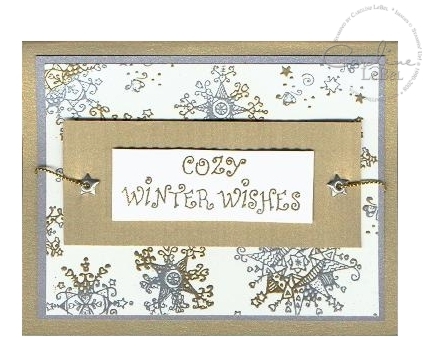 Here is one of my all-time favourite snowflake sets that Stampin' Up! 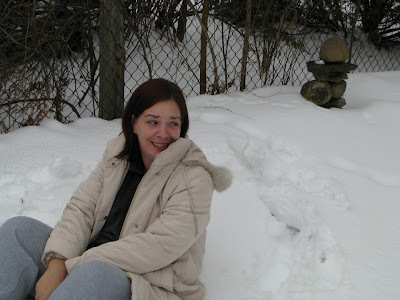 retired a few years ago: "Enchanted Snowflakes". This technique of "enamelling" requires you to make mutiple layers of heated embossing powder until it basically puddles into a steaming pile of lava. Okay, not really, but it will be melted and so you can press in your stamp and allow the EP to cool around it. Don't worry about damaging your stamp -- they can handle the heat! I then trimmed the image out, layered it on burgundy and then my glorious Shimmery White paper. Gawwwwwgeous, if I say so myself! My second card uses the same set, and a dual embossing technique of Gold and Silver powders. We'll be using this technique at Saturday's Holiday 10 card camp, but we'll use "The Snowflake Spot" set instead, to keep things current. 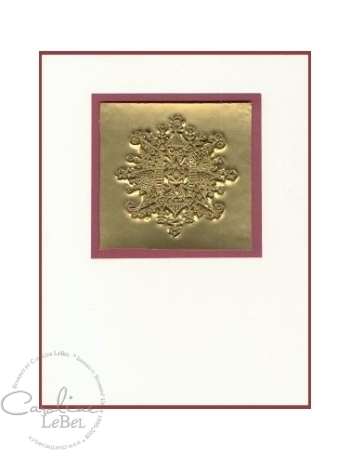 Brushed gold and silver cardstocks keep things shimmery in a low-key way, and it creates a cool effect in all. C'mon... I know you're out there :) Let me know you popped by! Just say hello -- I'd love to hear from you. Day 4 of Holiday Countdown: "Lovely As a Tree"
I've been a-digging through the archives again in search of some old standbys to share with you, and found one of my favourite "Lovely As a Tree" cards. In fact, we'll be making a very similar card to this on Saturday as part of the Holiday 10 Card camp. 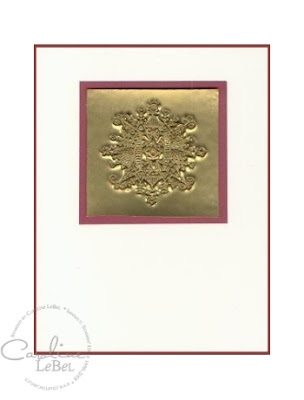 The nice thing about this card is that it's fast and easy to stamp, but the beauty & simplicity of the images make it an elegant holiday card to give away. I'm sure stampers around the globe heard my MASSIVE sigh of relief Saturday morning when the Retiring list was announced and my beloved LAAT was spared. Phew! I have at least another 6 months to keep sharing my lurrrrrve of that set with my peeps. 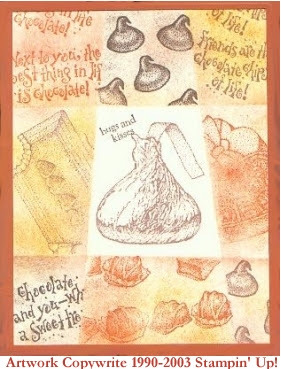 One of my favourite holiday memories as a child was that of the annual paper chocolate calendars, where you opened one "door" each day in December. The chocolate was uniformly pretty bad and waxy, but I just loved opening up those little squares each day - what a treat. 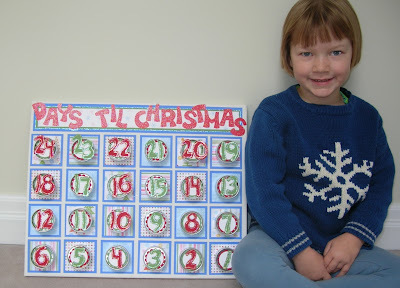 Imagine my thrill when I got an email from my friend Ardyth, showing me the Advent calendar she had made using a stretched white canvas, Designer papers and little metal tins (seen here with her adorable daughter). 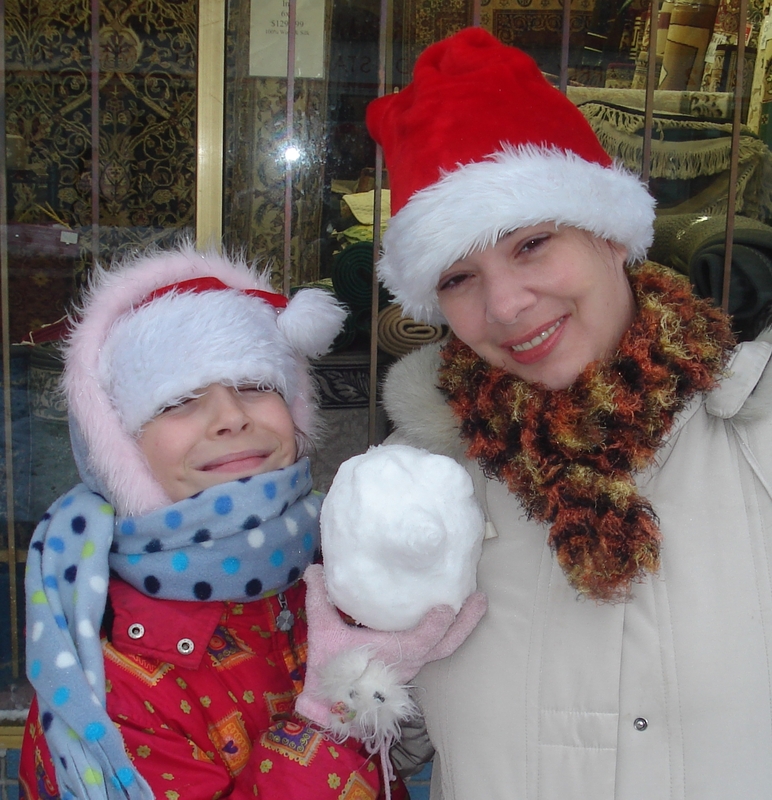 She was quick to tell me that is wasn't her original idea - she'd first seen one on Beate's blog. My response to that was, "Who cares where the idea comes from? I love it! Make ME one!!" I think this was the first time I'd ever commissioned a piece of art, but I definitely did not have the time nor materials at hand to pull one of these babies together by December 1. Besides, Ardyth's work is so beautiful...why not pay her to make me one, and have it be destined to become a family favourite? Needless to say, I was tickled pink (or should that be, green & red) when she delivered our new Advent calendar last week. Hey, she even stuffed each of the tins with 2 pieces of Lindt chocolates, knowing my monsters would be looking for the goodies within. Ardyth, I absolutely love it -- you did a phenomenal job and I'm seriously impressed. It was worth every penny and my family thanks you for the years of holiday magic we'll have with it! :) You rock, girl! p.s. 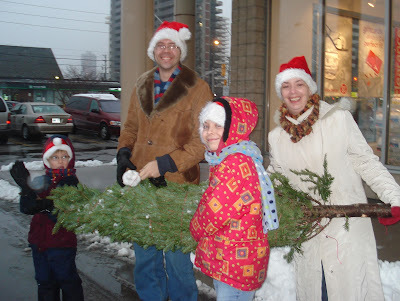 Despite Kathy thinking me a wussy weather wimp, we DID end up going out in the slushy sleet/rain yesterday afternoon to play with the white stuff & pick our Christmas tree out.